During the Sunday rain delay coverage of the 2012 Daytona 500, they played the 1979 fight scene (as they always do), and my dad recalled us watching that race live on the TV that my parents had in their bedroom in Omaha. I've watched every Daytona 500 since, and I've seen some pretty strange things over the years. But this year may have been one of the strangest. More on that shortly. 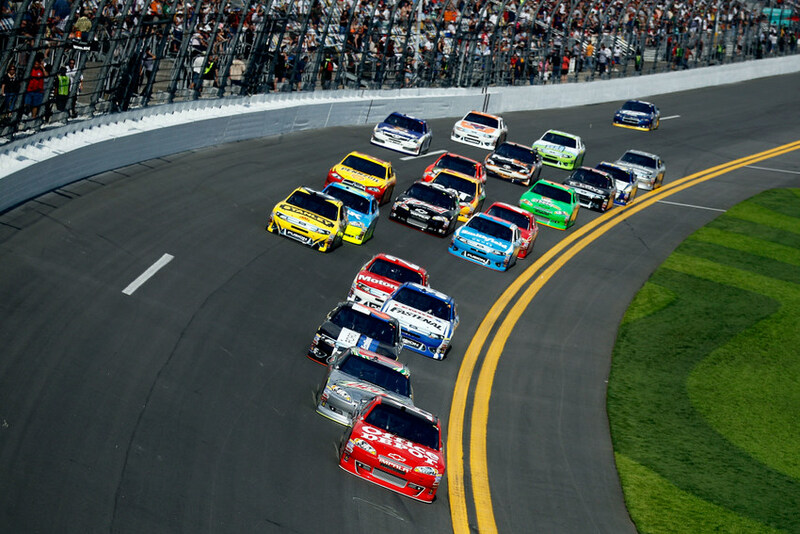 Daytona marks the biggest weekend of the NASCAR season, and the qualifying and support races take place over the course of an entire week. Indycar star Danica Patrick was the big news leading up to the show. The wildly popular marketing machine was the third woman to start the 500, and media coverage on everything she did was relentless. During the first Gatorade Dual at Daytona qualifying race last Thursday, Patrick made an impact with the inside wall that was so hard it loosened the teeth of people watching it on TV. 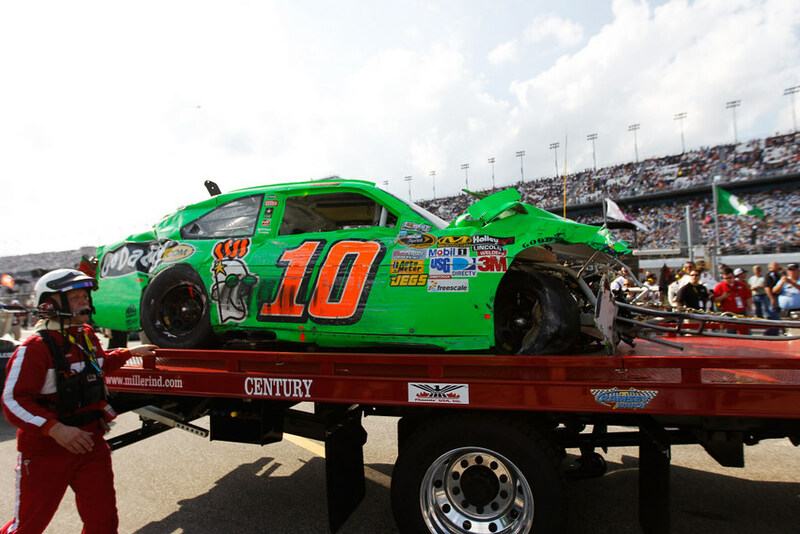 She was also in an early accident in the Nationwide race (where she had started on the pole), and she was caught up in a first-lap wreck during the Daytona 500. 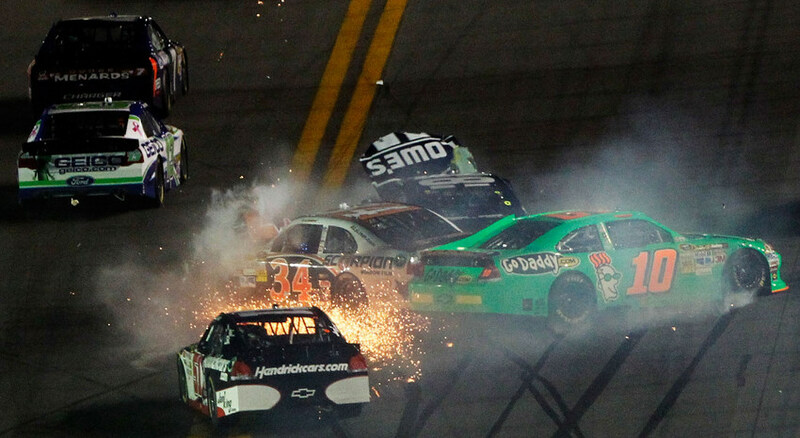 In fact, wrecks were the hot topic at Daytona. Last year, the cars were set up in such a way that they would run in pairs. Fans didn't like it, because it did away with the nail-biting pack races they had come to know and love at the Superspeedway. This year, the spoilers were shortened, car-to-car radio contact was outlawed, and the radiators were made smaller. All of this was designed to group the cars back together. And it worked. Of course, the side-effect of all this close racing is big accidents. Before I go on, I'm going to include a little editorial about crashes. My wife accused me of being too into the wrecks. That's not exactly true. I don't like it when guys wreck, but I want there to be the possibility. There ought to be some sort of risk, or at least perceived risk. I want to see cars on the edge. Otherwise, you might as well just go watch the cars drive by on the highway. The support races were both determined by wrecks this year. 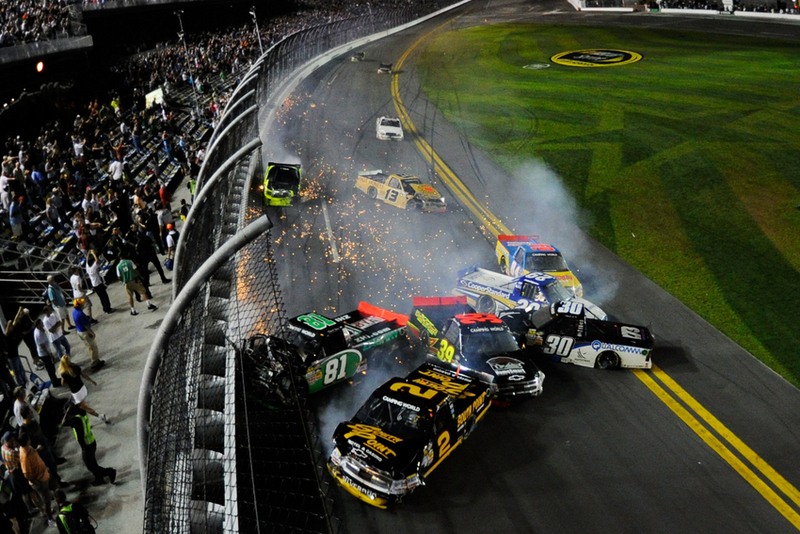 The Camping World Truck Series race on Friday went into triple overtime because of wrecks. On the final green-white-checker, rookie John King took advantage of a big crack up between Joey Coulter and James Buescher. John who? Exactly. 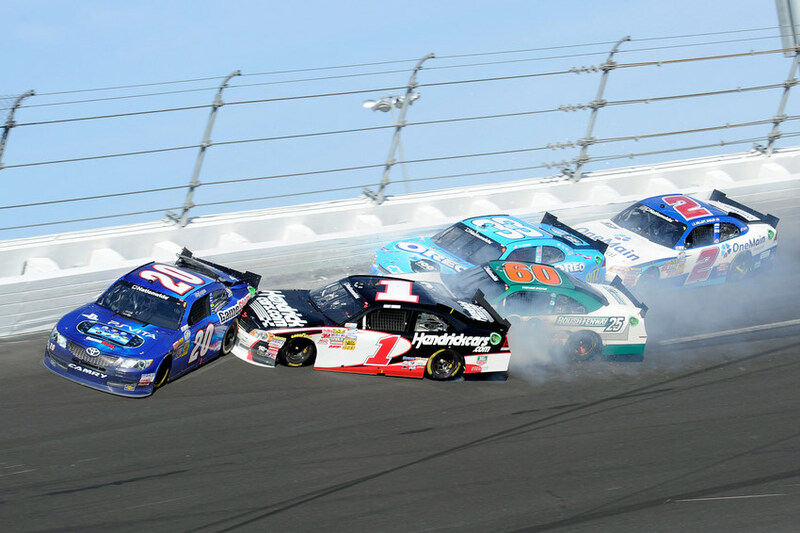 In the Nationwide Series event on Saturday, crashes again determined the outcome. Going into the final turn, James Buescher was running in 11th position. But somehow, some way, everyone in front of him crashed hard on their way to the checker. Brad Keselowski, who was also not in contention, finished second. On to the big show. 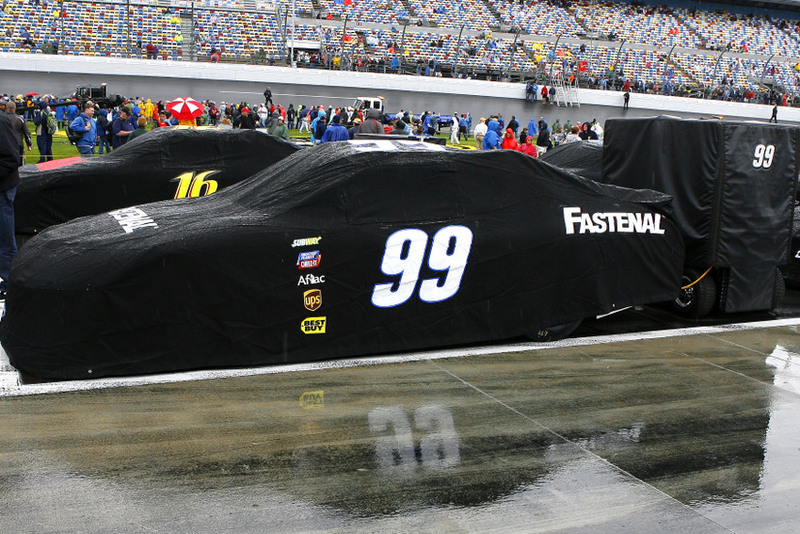 For the first time in 54 years, the Daytona 500 was not run on its scheduled day. That's a long time for a rain delay, but this was the year. 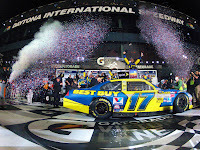 Not only that, but it was still raining on Monday, so the green flag didn't drop until 6:00 p.m. That means this was also the first time the Daytona 500 started under the lights, and the first time it was seen on prime time television. The race started nasty. 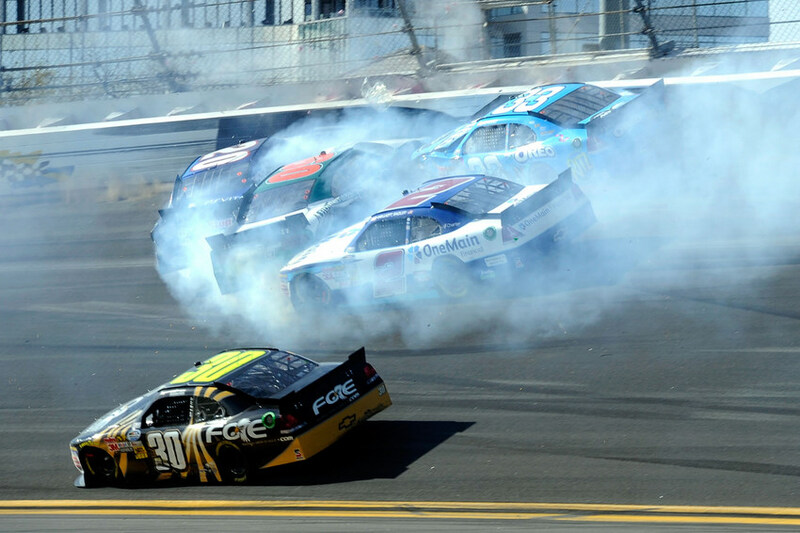 Elliott Sadler gave Jimmie Johnson an overly aggressive bump draft, sending the five-time champion into the outside wall. He then shot back down the track and was T-boned by David Ragan. Johnson was already in the hole as far as championship points were concerned, as he was caught earlier in the week with unapproved C-pillars on the Lowes Chevy. That, combined with a 42nd-place finish, could mean that Johnson enters next week's race in Phoenix with negative points depending on what kind of penalty is handed down by NASCAR. But the weirdest thing most race fans have probably ever seen happened with 40-laps-to-go in the Great American Race. 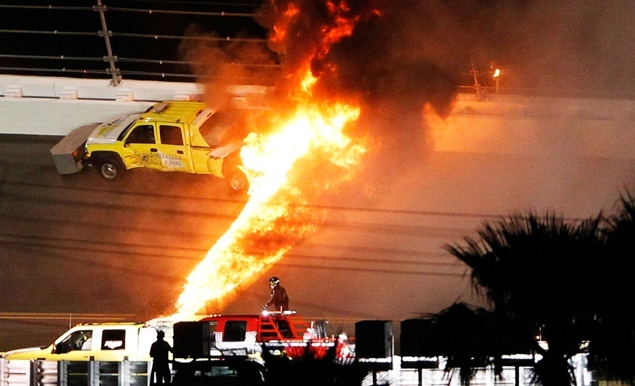 During a caution, Juan Pablo Montoya apparently broke something in his car while he was trying to catch up with the field after a pit stop, lost control, and clobbered a jet dryer service truck that was out on the track. The fire from the jet fuel was spectacular. It was also messy. Tired race fans were treated to a long, looong red flag while they drug the truck off the 31-degree banking with two fork lifts, and scrubbed down the track with Tide. Meanwhile, Brad Keselowski tripled his Twitter followers by posting updates from the track. The Twitter stuff was fun, but rumor has it that Keselowski might get penalized by NASCAR for having a recording device in his car. There were all kinds of wrecks in that last 40 laps. Guys were sloppin' and spinnin' around every few laps. But the actual race for the lead was a little on the bland side during this time. The problem was that unlike the pack racing of old, the outside lane was worthless. Nobody seemed to be able to hook up and pass there, so the cars were pretty much single file on the yellow line. 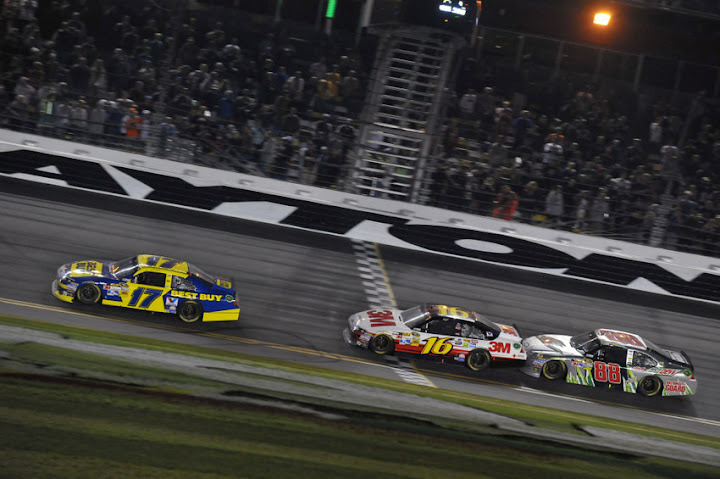 There was a green-white-checkered restart to finish this race after Tony Stewart and others were caught up in a crash. Matt Kenseth, Greg Biffle, and Dale Earnhardt, Jr. Broke away. Kenseth and Biffle are Ford/Roush teammates. It seems like Earnhardt should have been able to push Biffle around Kenseth, then the two of them would fight for the win at the last moment, but that just didn't happen. Biffle never really made a move, so Earnhardt just passed Biffle at the line for second. 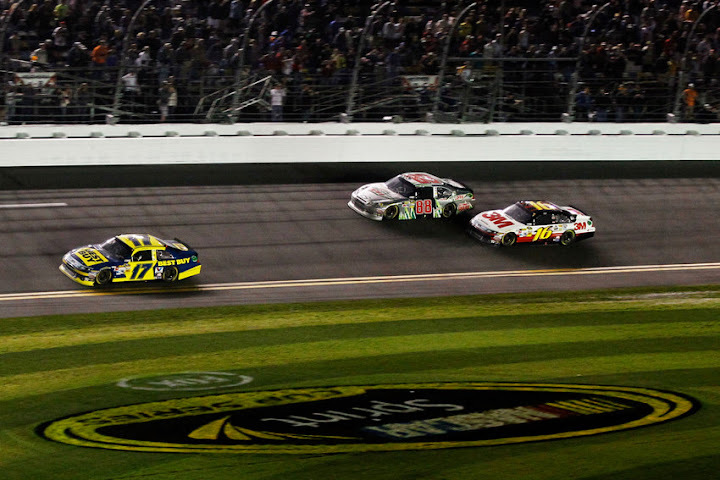 And just like that, Kenseth wins his second Daytona 500--and the longest 500 in history--right around midnight. The slideshow below has press photos from throughout the week. There are some really pretty shots down there, and you can read the captions and see who took them by clicking the balloon in the bottom left corner. I like having the album here, because it'll be a nice thing to look back at in the future. Keep scrolling down, and you can see all the race results. And if you really stick with it, there's a video of Montoya's jet dryer crash at the bottom of the page. 1. (4) Matt Kenseth, Ford, 202. 2. (5) Dale Earnhardt Jr., Chevrolet, 202. 3. (2) Greg Biffle, Ford, 202. 4. (31) Denny Hamlin, Toyota, 202. 5. (9) Jeff Burton, Chevrolet, 202. 6. (37) Paul Menard, Chevrolet, 202. 7. (13) Kevin Harvick, Chevrolet, 202. 8. (1) Carl Edwards, Ford, 202. 9. (12) Joey Logano, Toyota, 202. 10. (22) Mark Martin, Toyota, 202. 11. (30) Clint Bowyer, Toyota, 202. 12. (26) Martin Truex Jr., Toyota, 202. 13. (7) Marcos Ambrose, Ford, 202. 14. (32) Bobby Labonte, Toyota, 202. 15. (24) Dave Blaney, Chevrolet, 202. 16. (3) Tony Stewart, Chevrolet, 202. 17. (14) Kyle Busch, Toyota, 202. 18. (43) Terry Labonte, Ford, 202. 19. (41) Tony Raines, Ford, 202. 20. (21) Ricky Stenhouse Jr., Ford, 202. 21. (18) Ryan Newman, Chevrolet, 202. 22. (39) Landon Cassill, Toyota, 202. 23. (33) David Gilliland, Ford, 201. 24. (6) Regan Smith, Chevrolet, 200. 25. (36) Casey Mears, Ford, 199. 26. (38) David Reutimann, Toyota, Accident, 196. 27. (10) Elliott Sadler, Chevrolet, 196. 28. (34) Joe Nemechek, Toyota, 194. 29. (20) Kasey Kahne, Chevrolet, Accident, 189. 30. (11) Michael McDowell, Ford, 189. 31. (19) Jamie McMurray, Chevrolet, Accident, 188. 32. (23) Brad Keselowski, Dodge, Accident, 187. 33. (27) Aric Almirola, Ford, Accident, 187. 34. (15) AJ Allmendinger, Dodge, 177. 35. (40) Trevor Bayne, Ford, 164. 36. (35) Juan Pablo Montoya, Chevrolet, Accident, 159. 37. (42) David Stremme, Toyota, Engine, 156. 38. (29) Danica Patrick, Chevrolet, 138. 39. (28) Kurt Busch, Chevrolet, 113. 40. (16) Jeff Gordon, Chevrolet, Engine, 81. 41. (17) Robby Gordon, Dodge, Engine, 25. 42. (8) Jimmie Johnson, Chevrolet, Accident, 1. 43. (25) David Ragan, Ford, Accident, 1. Time of Race: 3 Hrs, 36 Mins, 2 Secs. Margin of Victory: 0.210 Seconds. Lead Changes: 25 among 13 drivers. Lap Leaders: G. Biffle 1-9; R. Smith 10-11; G. Biffle 12-14; P. Menard 15-16; D. Hamlin 17-40; J. Burton 41-57; J. Gordon 58; T. Stewart 59-60; J. Burton 61-67; G. Biffle 68-76; M. Truex Jr. 77-81; G. Biffle 82; T. Labonte 83-85; G. Biffle 86-99; M. Truex Jr. 100-101; D. Hamlin 102-129; G. Biffle 130; M. Martin 131-132; G. Biffle 133-138; D. Hamlin 139-143; J. Logano 144-145; M. Kenseth 146-157; G. Biffle 158; D. Blaney 159-164; M. Kenseth 165-202. Leaders Summary (Driver, Times Lead, Laps Led): D. Hamlin 3 times for 57 laps; M. Kenseth 2 times for 50 laps; G. Biffle 8 times for 44 laps; J. Burton 2 times for 24 laps; M. Truex Jr. 2 times for 7 laps; D. Blaney 1 time for 6 laps; T. Labonte 1 time for 3 laps; P. Menard 1 time for 2 laps; J. Logano 1 time for 2 laps; T. Stewart 1 time for 2 laps; M. Martin 1 time for 2 laps; R. Smith 1 time for 2 laps; J. Gordon 1 time for 1 lap. Top 12 in Points: M. Kenseth - 47; D. Earnhardt Jr. - 42; G. Biffle - 42; D. Hamlin - 42; J. Burton - 40; P. Menard - 39; K. Harvick - 37; C. Edwards - 36; J. Logano - 36; M. Martin - 35; C. Bowyer - 33; M. Truex Jr. - 33.